Population movements have changed radically in recent times, both in quantity and quality: “traditional” (economic) international migration is now accompanied by new types of mobility (refugees and displaced persons) caused by wars, persecution and environmental disasters. For Gisela P. Zapata and Gilvan R. Guedes, political manipulation of data, ineffective international cooperation and insufficient legal protection of these new types of migrants demand that demographers take the matter more seriously than they have done so far. In recent years, the world has witnessed an intensification of population movements (IOM, 2017). Data from the United Nations High Commissioner for Refugees (UNHCR) shows that while the stock of international migrants increased from 69.3 million persons in 1960 to 247.6 million in 2015, the ratio of displaced persons to international migrants increased tenfold in that same period, from 2.5% to 25% (Figure 1). 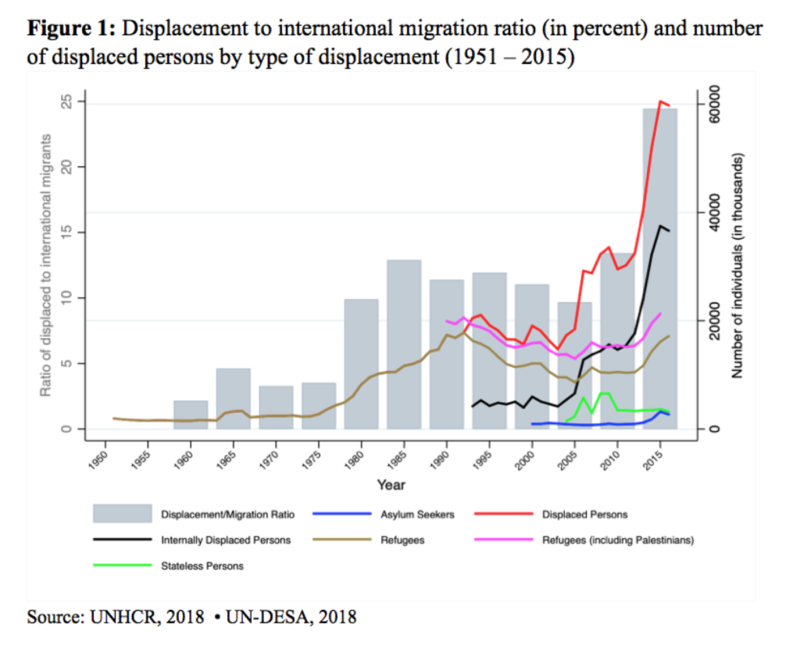 These figures are highly suggestive of two related processes: on the one hand, the increasing scale of international migration worldwide and, on the other, the growth of other forms of mobility over time. For instance, the number of displaced persons worldwide grew from 1.5 million in 1960 to 60.5 million in 2015, a forty-fold increase. 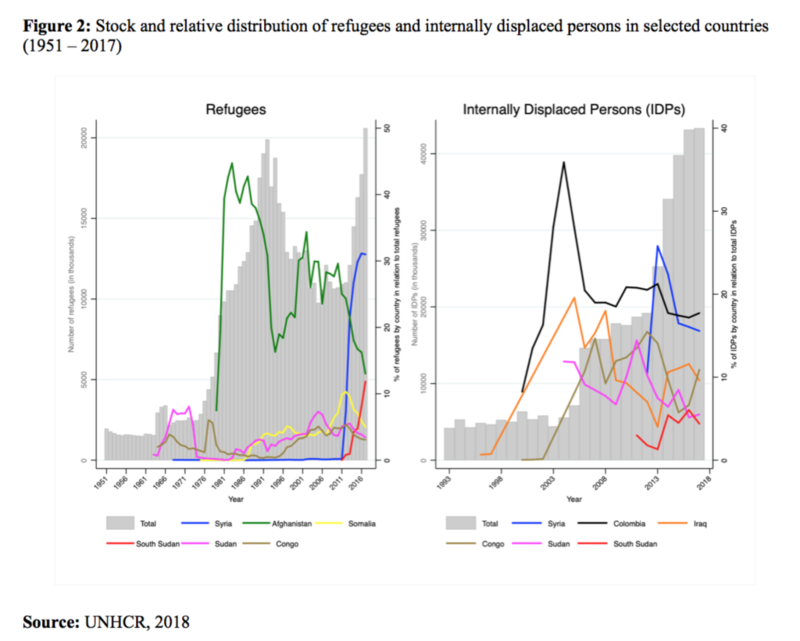 There has also been a change in the composition of these flows, with refugees losing their dominance among the displaced: in 2006, Internally Displaced Persons (IDPs) due to conflicts already outnumbered refugees. This points to another interesting feature of the evolution of mobility in recent years, its growing complexity and the highly heterogeneous nature of the movement of individuals across space. Population movements have also become more complex in terms of their causes and consequences. The traditional idea of a migrant who opts for a well-defined migratory project has gradually been replaced by the figure of an agent whose aspirations, intentions, and opportunities for movement are shaped by a rapidly changing socio-political and economic context. Moreover, new events such as political conflicts and environmental disasters have created unprecedented challenges for understanding how and why individuals move, and what legal and humanitarian protection ought to be offered to them. While Afghanistan, Somalia and Sudan dominated the stock of refugees until the mid-2000s, the Syrian and South Sudanese conflicts have made their mark in recent years (Figure 2). The impact of the Syrian conflict on the mobility of its population has been dramatic since the very outset. Syria has dominated the yearly flows of refugees since 2011 and surpassed the historical dominance of Colombia as the country with the highest number of internally displaced persons (IDPs) in 2013. The scales of the yearly flows of IDPs for the other countries shown in Figure 2 mirror the outbreak of local conflicts. These figures reveal that the world today is a lot more complex than in the years that followed the Second World War, when much of the displacement was concentrated in Europe. The world was also less interconnected, making distances seem longer and destinations more uncertain. It was in this context that the United Nations Convention Relating to the Status of Refugees was created in 1951. The Convention sought to guarantee protection to European citizens who, as a direct consequence of the War, had a well-founded fear of returning to their country of origin on account of their race, religion, nationality, social group, or political orientation. Some years later, the 1967 Protocol Relating to the Status of Refugees was an important step towards the ‘democratization’ of these protections, removing the temporal and geographical restrictions of the Convention by extending the right to seek protection (asylum) to any citizen, not only from Europe. 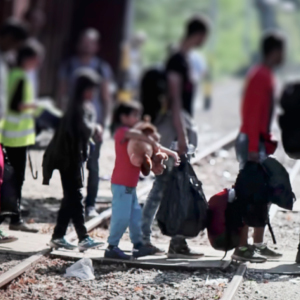 Since then, new dynamics and types of displacement have led to discussions on the need to retool these normative instruments, which constitute the central elements of the international refugee protection system. Some examples of the increasing complexity of these new movements are the growing numbers of people forced to leave their home because of their inability to guarantee their socioeconomic reproduction or who are escaping from conditions analogous to war. Displacement caused by environmental factors is another visible example of this complexity (IDMC, 2017). These new mobilities highlight the need to develop regulations that are more consistent with the principles contained in the 1948 Universal Declaration of Human Rights. They also raise questions about the impact of these movements on the economies of the countries of destination, as well as their potential for cultural and political conflicts. The emergence and intensification of old and new conflicts and crises have affected a growing number of countries in the Global South such as Libya, Syria, Yemen, Venezuela, and the Northern Triangle of Central America. There has also been a significant increase in the numbers of people displaced by environmental disasters linked to climate change. It is estimated that in 2016 alone, 31.1 million people were (internally) displaced by conflict, violence, and disasters: one person is forced to flee every second. Of these, 6.9 million were displaced by conflict and violence, mainly in Sub-Saharan Africa and the Middle East, while 24.2 million were hit by climatic events such as typhoons in China and the Philippines, and floods in Indonesia and the Indian Subcontinent (IDMC, 2017). Although the developing world hosts 85% of the world’s refugees (UNHCR, 2018a), the so-called “refugee/migrant crisis” has been accompanied by the politicization and increasing criminalization of population movements. The criminalization of migration, and mobility more generally, has been underpinned by the misuse and overestimation of migration data for political purposes, even though the stock of international migrants (including refugees) has remained constant since the 1960s, at around 3% of the world’s population (de Haas, 2017). The image of “invasion” propagated by the media has exacerbated the negative perception that surrounds these population movements, provoking the (re)emergence of often openly racist and xenophobic ultra-right-wing nationalist parties in the European Union. The corollary of this phenomenon has been the withdrawal of the United Kingdom from the European Union (Brexit) and, on the other side of the Atlantic, the election of Donald Trump to the US presidency. In this context, population mobility has become one of the most important issues of the twenty-first century, a fact made clear by the increasing visibility of the UNHCR and the recent conversion of the International Organization for Migration – historically an advisory intergovernmental organization – into an official UN body. There has also been an intense promotion of migration management and control instruments, and of the migration-development nexus, in particular through the implementation of a series of political, social, and economic policies that seek to incorporate diasporas into the national policies of their sending-countries. These efforts were recently materialized in the Global Compact for Safe, Orderly and Regular Migration and the Global Compact on Refugees to be adopted by the UN General Assembly in December 2018. However, discussions at the international level have, for the most part, placed little emphasis on the main drivers of contemporary migration flows, namely, the intensification of economic globalization, the rise in socioeconomic inequalities within and between countries, and the pre-eminence of demographic factors, which influence the pattern and composition of contemporary flows (Livi-Bacci, 2012). In this context, demographers and social scientists have a lot to contribute towards understanding the causes and consequences of contemporary population mobilities, especially by working across disciplinary boundaries to address the current conceptual and methodological gaps that are holding back the production of research-based evidence for public debate and policy formation at the national and international levels. de Haas, H. (2017). Myths of Migration: Much of What We Think We Know Is Wrong. Spiegel Online. Hamburg, Der Spiegel. IOM (2017). World Migration Report 2018. International Organization for Migration (IOM). Geneva. Livi-Bacci, M. (2012). International Migration: a global force, ungoverned. População e desenvolvimento em debate: contribuições da Associação Brasileira de Estudos Populacionais C. Maldonado Turra and J. M. P. da Cunha. Belo Horizonte, ABEP. UN-DESA (2018). Population Division: International Migration. UNHCR. (2018a). Global Trends: Forced Displacement in 2017. Geneva.